Real time bus tracker at bus stop in Chicago. Photo from @CDOTNews on Twitter via Grid Chicago. 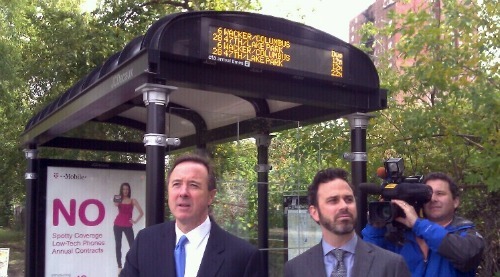 Chicago’s Mayor Rahm Emanuel and Director of the Chicago Department of Transportation Commissioner Gabe Klein (pictured, center with CTA President Forrest Claypool at left), announced today the installation of real-time tracking of buses at bus stops in that city. It just goes without saying that I like this, right? and to think I dream of the day when RIPTA bus signs included line numbers. That’s brilliant! So simple, but genius. I’m impressed that Mayor Emanuel has an awareness of what the experience of waiting for the bus is like. Noting how people stand in the road to look down the street to see where the bus is. He probably isn’t often waiting for a bus himself, but he’s at least aware of the experience. Love it! Anyone who has ever been hoping to catch the last bus and gotten worried when it didn’t show will appreciate this.